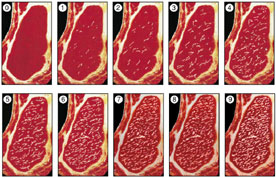 The AUS-MEAT Marbling system provides an indication of the amount of marbling in beef. The MSA marbling system provides an additional indication of the fineness of distribution and the size of marbling pieces. AUS-MEAT Marbling reference standards and MSA marbling reference standards can be used in harmony to provide more detail about the product. Marbling is the fat that is deposited between muscle fibres of the M. longissimus dorsi muscle. 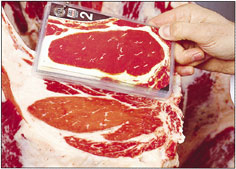 Marbling is assessed and scored against the AUS-MEAT Marbling reference standards. Marbling is an assessment of the chilled carcase and scored by comparing the proportion of marble fat to meat at the surface of the assessment site which lies within the M. longissimus dorsi boundary. Marbling is assessed against the proportion of marbling to meat depicted in the Marbling reference standards. Chiller Assessors who assess marbling above marbling score 6 must hold a high marbling endorsement as well as holding the standard Chiller Assessment qualification.